Iola is most famous for the Sunday morning incident in which bikers mounted up and charged angry concertgoers who had been chucking rocks and bottles at them in response to thefts and violence committed by the bikers. Not all of the scheduled acts played—Spirit, Johnny Winter, Steve Miller Band—and some late additions did. 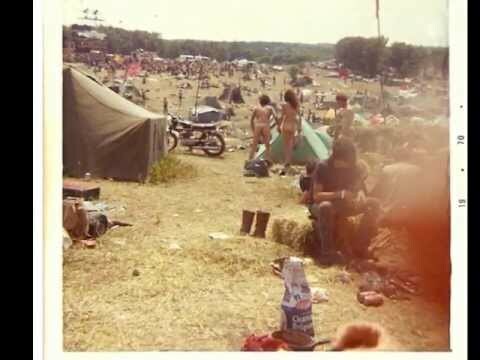 The Portage/Waupaca County line near Iola, about 80 miles west of Green Bay and 140 miles north of Madison, The 200-acre festival site was partly wooded, with a long, sloping field that created a natural amphitheater. The only building on the site was an old barn with a lily pond nearby, which had been taken over by the bikers for a campsite. It was the lowest point on the site, to the left of the stage area. the music in the video is played by three high school kids! tom hansen, and brothers dave & keith dicianni. Film from "The People's Fair," also known as "Wood Tick 1970." Acts included Chuck Berry, Ravi Shankar, Paul Butterfield Blues Band, Buffy St. Marie, The Amboy Dukes, The Stooges, Brownsville Station, Buddy Rich, Mason Proffit and many regional bands. Included: crowd footage, the stage, the traffic checkpoint, the water tanker, the pond, the bikers, the Acid Rescue Crew, hundreds of fire pits and much more, possibly footage of you. Some good aerial shots, as well. Apologies for the static, it came from the transfer from the film footage to VHS. Newscast about "The People's Fair." 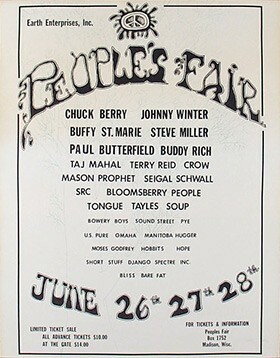 Acts included Chuck Berry, Ravi Shankar, Paul Butterfield Blues Band, Buffy St. Marie, The Amboy Dukes, The Stooges, Brownsville Station, Buddy Rich, Mason Proffitt and many regional bands. The festival's third day was marked by shootings and the offending biker gang being run out of the festival.